The Chinese Students and Scholars Association Manchester (CSSA-MAN) formed in 1982, is supported by the Education Section of the Chinese Embassy of the People’s Republic of China, It is the largest network of Chinese Students and Scholars in the Northwest, and is primarily focussed on supporting Chinese students in the Greater Manchester area. Each year CSSA-MAN welcomes thousands of students across a number of campuses encompassing： The University of Manchester, Manchester Metropolitan University, The University of Salford and The Royal Northern College of Music. 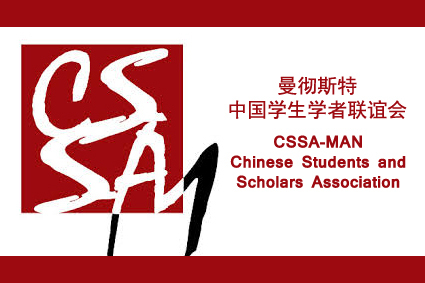 In the 33 years since its formation, the core values and aims of CSSA-MAN have not changed, We are a non-profit, non-religious, non-political organisation, aimed at supporting & improving the lives of the Chinese students here in the UK as well as promoting the exchange of Sino-British culture. Every year CSSA-MAN holds a diverse variety of events; from sports, entertainment and culture oriented events to academic or career related workshops. However, the biggest event by far, is our annual Chinese New Year Gala, where we make one lucky venue our home, inviting old and new friends to join us for an evening of celebrations. The Chinese New Year Gala is a celebration of cultural exchange, goodwill and family. Thank you for joining us and being a part of our family this evening. We hope the 2015 Year of the Ram brings you and your loved ones health, happiness and prosperity.